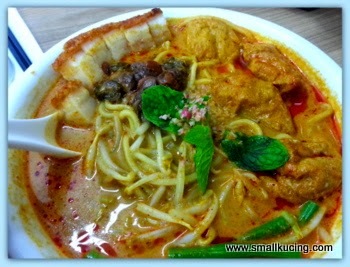 SMALL KUCING: Curry Mee at Old School, Jaya One PJ. Curry Mee at Old School, Jaya One PJ. Now Jaya One is my Sunday hang out. Love the place. Now loads of kids knows about this "Sun Day Out" by Jaya One and they kept coming back for more. 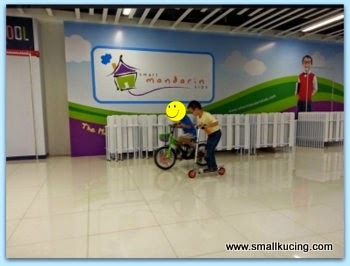 Think parents also like it la coz it provides a safe environment for their kids to learn to cycle. Me pulak can meet up with loads of friends. 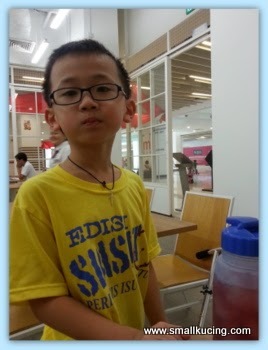 Just two weeks ago, I played with Mamarazzi's schoolmate son.Mamarazzi have not met her school mate since.....gosh....since Form 5. They got reconnected through FB. Where did Papa and Mamarazzi hang out while I went "international roaming"? Well....sometimes at the coffee house nearby...sometimes they picnic at the "field" on first floor. And sometime at Old School. One of the weekends, Mamarazzi was super hungry. Off to the Old School la while I went "international roaming"
For Mamarazzi...she likes the Prawns Noodles. Sorry ah....photo makes it look so ugly. Blame it to no skill Mamarazzi. But taste wise....yum....and portion big too. She can't finish it. Papa had to help. Disclaimer : This is not a paid post . Wooooooo!!!! Looks good. Wahhhhh!!!! Shallots very cheap there, is it? That's at least half kg of it, fried. So much! LOL!!! wah so nice.. going to The School every Sunday huh?? definitely this School is more fun than the school Small Kucing goes to every weekday huh?? hehe..
eih.. Uncle SK saw one water bottle at the corner, Mamarazzi make iced Ribena for Small Kucing ke?? so nice lah.. Long time didn't drink Ribena leh, maybe later go and buy one small bottle punya, then add in lemon become Lemon Ribena, so nice leh.. sometimes in those HK style restaurant also order this to minum.. Yes....hahaha pandai leh. Put lemon become lemon ribena. mak oi!!! look at the curry noodles, so rich and so kao and so loaded with liu, also very generous with the siew yoke and taupok leh.. the prawn noodles also sedap leh, are those ribs ah?? Uncle SK wanna try that also.. I also beh tahan with roasted pork. The curry mee does look tempting. So many ingredients in it. That smiley head so cute la, cant help but keep laughing. Oooo curry mee, with siew yok somemore. I can eat two bowls, including another bowl of liew.. I want!! really ah...can eat so much or not??? That roast pork... ok I'm totally going for this! The curry laksa is yum. Must try. I simply such a dish. YES! A safe place to ride with no cars speeding past! The food looks wonderful!! Wah!!! 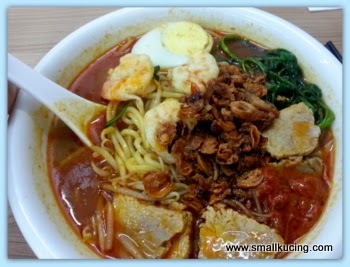 both curry and prawn mee really look so yummy & mouth-watering. I want to eat both of them haha! Sure seems like a fun place for the family!! Oh wow, that food looks so amazing to me! Wah ... the curry really looks good leh... so red. Can see from the pix! hahahaha.....too bad not ramen is it? The prawn noodles really look authentic and tasty! The roast pork curry too - looks really good. I take your word that the curry mee is good! I will go there to try soon. Isn't it funny how Facebook gets us in touch with a lot of old friends. No GST on All Books says Big Bad Wolf Books ! !